Archives are the documentary history and collective memory of society. Archives can help people connect to their family, neighbourhoods, communities, nation, etc. by showing us a glimpse of where we’ve been and how we got here. They can help us form a sense of identity and community. Archives also provide accountability and transparency by giving evidence of past actions and decisions. In 2011, UNESCO adopted the Universal Declaration on Archives and formally recognized the importance of archives in society. The Declaration was drafted by the International Council on Archives and is based on a declaration written by archivists in Quebec. Some archives are internal to their parent organization and access is closed to the outside; for example a corporation’s archives is usually only accessible to its employees. Other archives are widely accessible; the City of Edmonton Archives serves the employees of the City but is also open to the general public. People use archives for many reasons; historical research and genealogy, for legal issues, environmental assessments, education, news stories, art and literature. Archival users range from students to engineers, from artists to environmentalists. Archives are also used to address past wrongs and start the healing process. An example is the Truth and Reconciliation Commission of Canada which, with the help of archives across the country, is addressing the reality of residential schools and their impact. 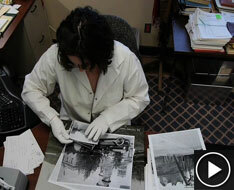 Archivists work with their community to preserve its documentary heritage. An archivist’s community can vary widely, from a province or city to a small town, from a large corporation or organization to a small historical association. Archivists acquire and preserve records of permanent legal, administrative, financial and historical value. They manage the records in their care through appraisal (selecting which records to keep), arrangement and description. They preserve records over the long term by providing optimal storage and access conditions. Archivists facilitate access by providing context to the records and by producing finding aids that allow archives users to locate records of interest. An archivist’s work can vary widely. Larger archives usually have specialists ranging from reference archivists who work with the public to media experts like photograph, audio-visual or digital archivists. In small archives there is often only one archivist who has many roles. To help archivists there are provincial and national organizations like the Archives Society of Alberta and the Association of Canadian Archivists. These professional organizations connect archivists, share expertise and provide funding and educational opportunities. There are several routes to becoming an archivist. While there are archivists who start out with minimal experience and gain knowledge and expertise on the job, increasingly a master’s degree is required. Archivists have degrees in archival, library, and information science or history and related disciplines.